The UK Government’s new fishing minister used his first ministerial visit to Scotland to meet workers in Peterhead yesterday. 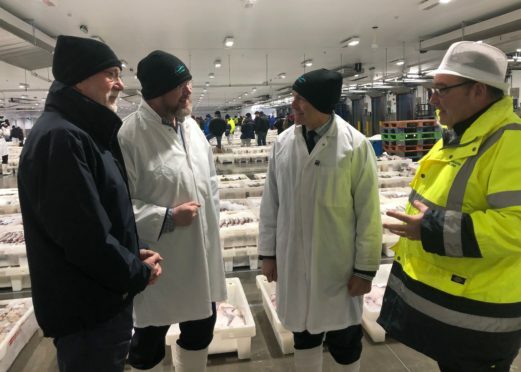 Robert Goodwill, who was appointed last month, spent the morning with supplier and skippers at a fish market along with Banff and Buchan MP David Duguid. Mr Goodwill, speaking after the visit, said: “I was delighted to accept David’s invitation to make my first ministerial visit to the key fishing port of Peterhead. “There is clearly a huge opportunity for Scottish fishermen in leaving the common fisheries policy and becoming an independent coastal state. “I have enjoyed talking to both the catching and processing industries here in Peterhead and I was particularly impressed with the enthusiasm shown for encouraging more young people into the sector. Mr Duguid said: “I was pleased to welcome the minister on his visit to Peterhead – hopefully the first of many. “He was very impressed by how modern, efficient and large-scale the fish market is.